Why all airlines should boycott the hunting industry. Refusing to transport hunting weapons and trophies would help preserve African wildlife - particularly the magnificent predators. Let us deal specifically with lions, although the arguments in favour of a total embargo on transport of all wildlife trophies and body parts would follow logically. Virtually all lions killed in SA are captive bred. This is because there are so few wild lions in the fragments of ‘game reserves’ - less than 3000, whereas there are about 8000 captive lions being bred exclusively to be hunted. There is no conservation value in lion farming. 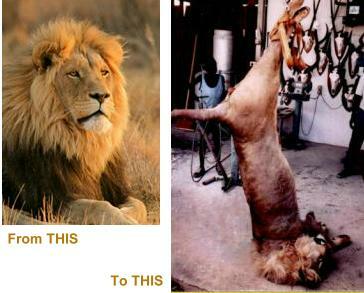 Lion farming and canned lion hunting is a cruel and corrupt industry at all levels. The soldiers of fortune who profit from making cruelty to lions routine, are adept at concealing their environmental terrorism behind a veil of conservation. Tame lion trophies are fraudulently exported as those of wild lions. Commercial exploitation of lions as alternative livestock is fraudulently represented as ‘conservation.’ Lion cubs are (ab)used for cub petting, and tourists and volunteers are deceitfully assured that the animals will be ‘released back to the wild’ or ‘retired’ when they grow older. Lion bones are sold to Asian wildlife crime syndicates who fraudulently sell the processed product as ‘tiger bone wine’ which is fraudulently alleged to be a panacea for all ailments, from erectile dysfunction to cancer. SAA was forced to ban the carriage of major wildlife body parts to protect its brand. And to avoid prosecution in respect of fraudulently mis-labelled cargo. But any industry that does business with a hunting industry which is so fraudulent at all levels, is bound to find its brand compromised sooner or later. Trying to regulate a hunting trade which is so corrupt at all levels would be hard enough for a lean, efficient authority. Unfortunately, CITES is notoriously inefficient, cumbersome, bureaucratic and riddled with corruption, incompetence and political influence. And that is only the start. Google ‘regulatory capture’ and you will be shocked to see how common it is for Big Business to invade and control its own regulatory authorities. Big Hunting is no exception. So add to CITES’s many systemic problems the fact that it is tightly controlled by the wealth and lobbying power of pro-hunting NGOs like WWF. “Trophy hunters are a massively powerful lobby,” said Ian Michler, an investigative writer, conservationist, and South Africa-based safari operator who spearheaded talks with the Australian government last year. He’s now in discussion with members of the European Parliament. SA conservation - an ugly, dysfunctional mess. It is hard to explain to airline executives just how dysfunctional conservation structures are in Africa. Most SA provincial authorities can properly be described as in a state of collapse. North-West province conservation department was for many months without even a fax machine, as all the fax machines had been re-possessed by the supplier for non-payment.The Lion Management Plan produced for the SA government expresses concern at how, over a ten year period, nearly 3000 lion trophies were exported from SA as ‘wild lion trophies’ (in order to get around the Rowland Ward trophy book exclusion of trophies from captive-bred lions) when in truth all but less than one hundred were trophies of tame captive lions. So documents and certificates given by most African conservation bodies cannot be accepted at face value. Permits tend to follow the money rather than the law. So in conclusion, airlines should realise that the so-called ‘legal’ wildlife trade is a major threat to the survival of African wildlife, and if the airlines have any sense of responsibility for preserving the iconic African lion, they should all place an embargo on the carriage of lion trophies, lion bones and body parts.